Do you have a little one who likes trucks? Then you need to pick up this charming story of friendship and fun. The trucks are throwing a surprise party. Each truck has his job to do to get ready for the guest of honor. 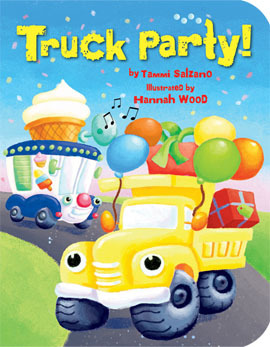 Truck Party by Tammi Salzano is a fabulous way to help your truck-loving youngster celebrate the joys of friendship. As you read of every truck doing his job, your child will understand how great it is when friends work together for something special. The bright illustrations in vibrant primary colors by Hannah Wood, make this story come alive. Giving the trucks eyes makes them seem more like people than machinery. This book would make a wonderful gift for any child interested in trucks, but it’s also a fun book to read to any child. And at only $7.95, it’s a great value.